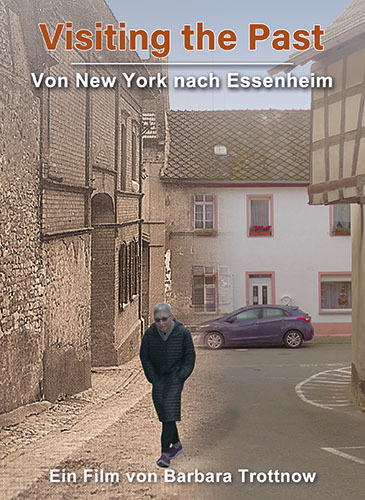 The film accompanies Joan Salomon from New York on a visit to Essenheim (near Mainz, Germany). Her Jewish family had to leave the village in 1934, after the hostilities had become too strong when the Nazis came to power. Only her mother managed to emigrate to America, her grandmother and her aunt were killed in a concentration camp. 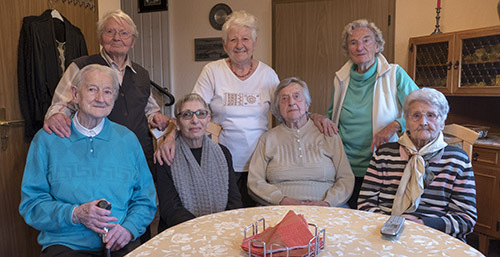 On the traces of the past she meets old Essenheim women who knew her family. In the place that could also be her one, she is warmly welcomed. The oldest resident, born in 1920, went to school with her mother's younger sister, they were good friends. Another woman from Essenheim tells her what it looked like after the Reichspogromnacht in the demolished synagogue. 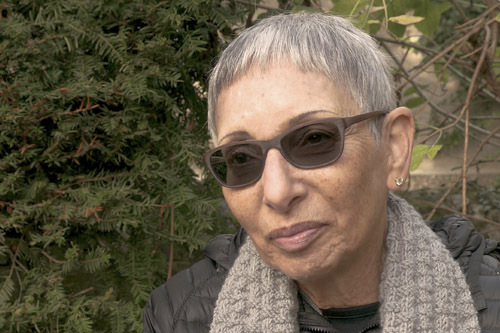 Joan Salomon was born in New York in 1945, but the past also determined her life. Her mother has never forgiven herself for failing to bring the rest of the family to America. So she hardly told her daughter anything about her life in Germany. But nevertheless Joan Salomon feels very close to the wine village and is happy about every little detail she learns about her family. The film describes the desire for home, the search for origin, but also the way in which those who had never been away dealt with the past. It tells history and stories that will soon be lost because no one can tell them anymore. Three commemorative brass plaques (Stolpersteine) in Essenheim remind us of the Mayer family. Helina Mayer was the mother of Joan Salomon. When she had received her high school diploma (Abitur) with good grades in 1934, the Jewess was not allowed to study. With minor office jobs she earned the money for the transit to America. The family ran a small grocery store in Essenheim. They were poor people, her aunt's girlfriend tells, but they were very kind. She often visited them and does not like to remember that the family had to leave the place. Her friend Ruth and their mother Jettchen were forced to live in a Jewish house (Judenhaus) in Mainz and were then deported to Treblinka. In her mother's estate Joan Salomon found letters, which she had received from her mother in Germany in the early 1940s, when she was already in America. Distressing documents showing how urgently her grandmother wanted to leave Germany. In the documentary the granddaughter reads from them. "I've survived with a survivor," says Joan Salomon about the difficult relationship she had with her mother. She denied her to speak German and insisted that she was an American. Not until now she begins to learn the language of her ancestors. 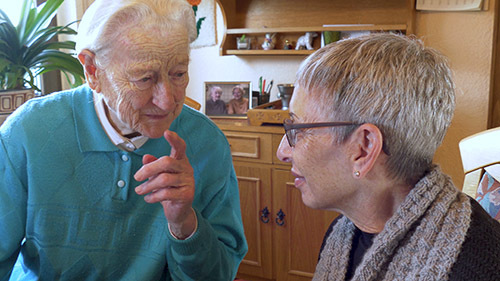 Joan Salomon wants to be able to communicate with the people she meets in Essenheim, being able to tell her about her family. The old ladies from the village have invited the 'American' for coffee and tell her about the time when the Jews lived together with them in the village. Joan Salomon has the feeling that they liked her family very much. This makes her feel good, also because the women transfer their sympathy to her. Elsa Schmahl is from the local history association. Born in 1935 she no longer knew the Jewish families personally. But together with younger people from the village she did some research. Touchingly, she looks after Joan Salomon. In her small local history museum she shows her pieces from the houseware of her mother-in-law. By chance the two women find a 'pattern cloth' between the handicrafts. On such, embroidery was practiced at school. A similar one Joan Salomon's mother took with her to America. "That's the only link to a family I never knew." she notices afterwards. She wants to come back, can even imagine living in Essenheim. Sometimes it's small things that change a lot and help to heal wounds. Main sponsor is the "Stiftung Rheinland-Pfalz für Kultur".